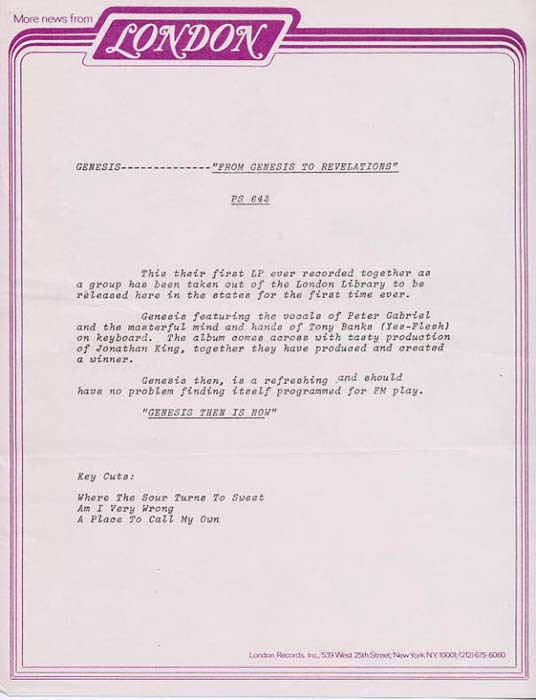 Press kits are rather obscure items. 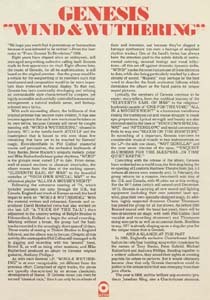 They can also be fairly boring with the typical promotion and copied newspaper articles. 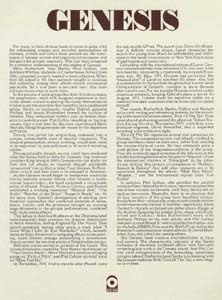 However, some have interesting sections and I tried to include them here. 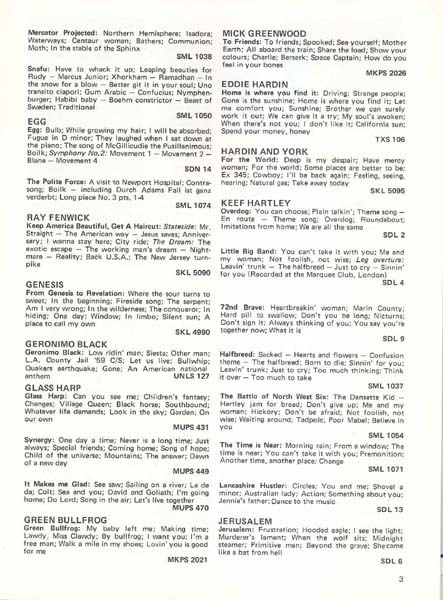 Very rare French Pop catalogue from April 1971 listing Trespass. 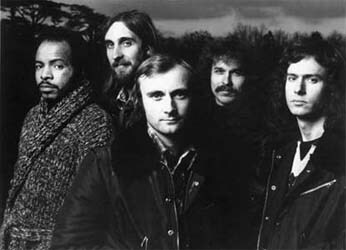 Supported by many labels including Philips, Fontana, and Vertigo. 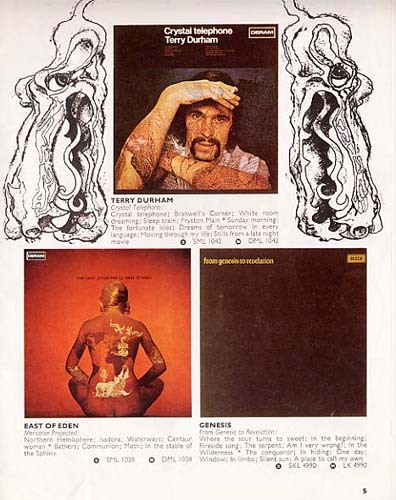 Very rare B&C Records Catalog, late 1971. 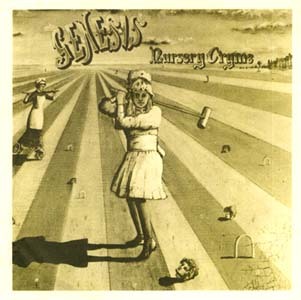 Includes Trespass and Nursery Cryme. Awesome comic book style. 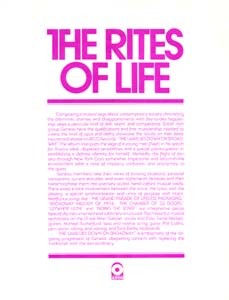 Includes regular gamut of Charisma artists - VDGG, Monty Python, Lindisfarne, etc. 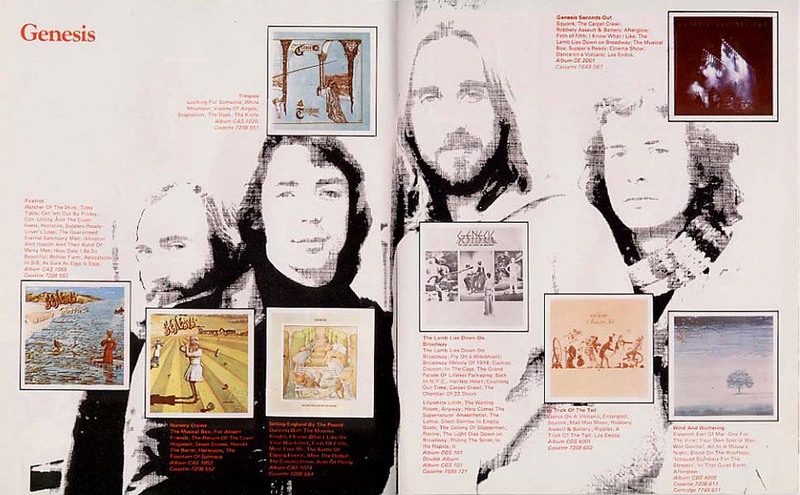 The Nursery Cryme US EP was originally shipped in June 1972 with a promo sheet from the record company and two promo B&W photos. 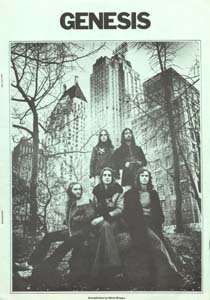 A press kit from late 1972 or 1973. 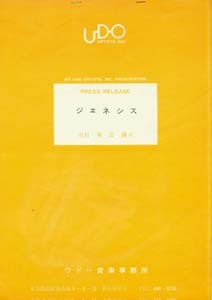 Includes a 2-page bio, a 1-page information sheet, and 2 nice B&W photos. 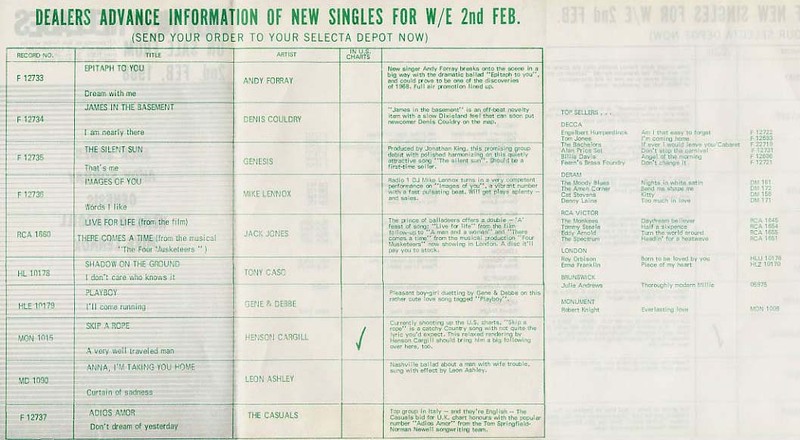 UK Record Catalogue from B&C Records, 1973. 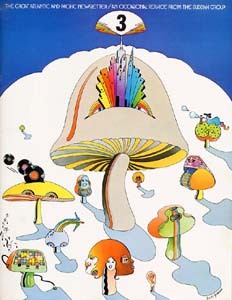 Includes many other artists such as Monty Python, Lindisfarne, The Nice, and Capability Brown. 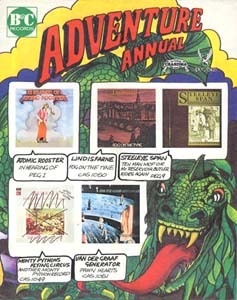 Decca Record Catalog 1973 with many different artists. 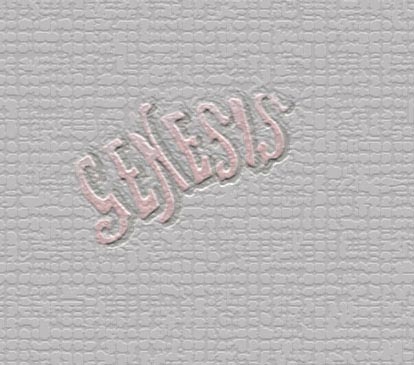 Only a small section on From Genesis to Revelation. 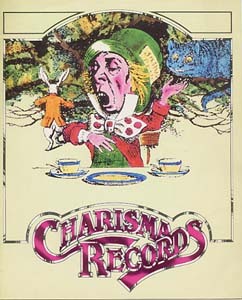 Charisma Artist Catalogue 1973. 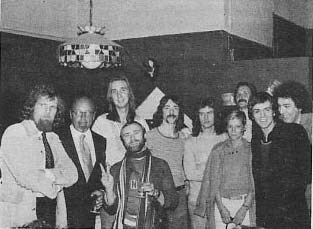 Includes many other artists such as String Driven Things, VDGG, Lindisfarne, and Monty Python. 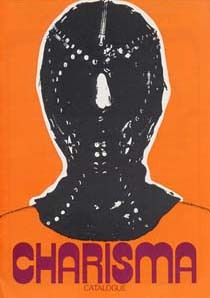 A press kit from early 1973 in a orange cover. 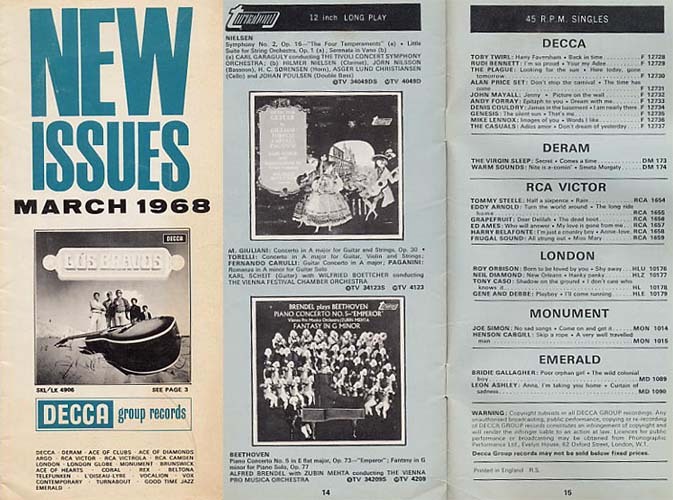 Comes with 2 publicity photos and several photocopied articles. 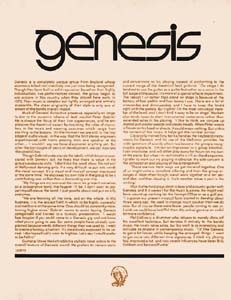 A press kit from 1973 called Genesis 1:1. 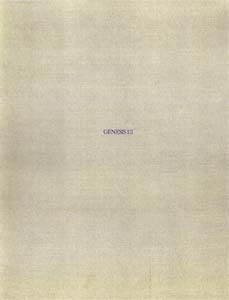 It is a nice presentation on grey cardboard. 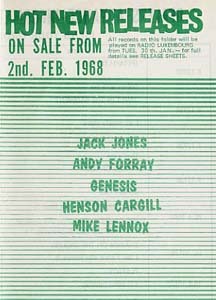 It also promoted the Foxtrot album on the back cover. 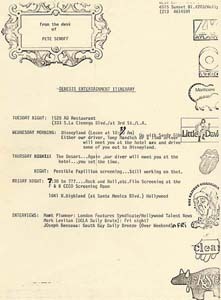 Very rare presskit from Buddah Records "The Great Atlantic and Pacific Newsletter" 1973. 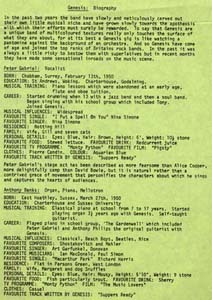 October 29, 1973 Charisma information sheet with details about each band member. 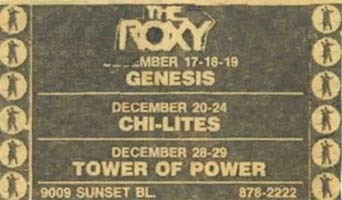 Entertainment Itinerary December 18-21, 1973 for the many Roxy shows in Los Angeles. 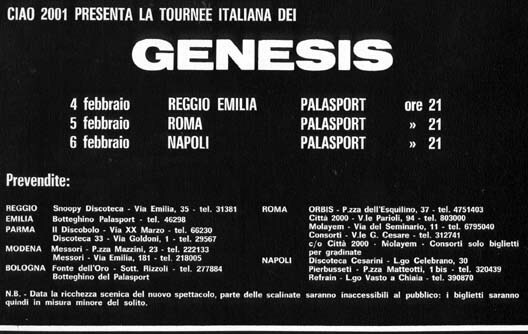 Italian tour itinerary February 2-5, 1974 detailing hotels, bus routes, and entertainment. Very humorous. 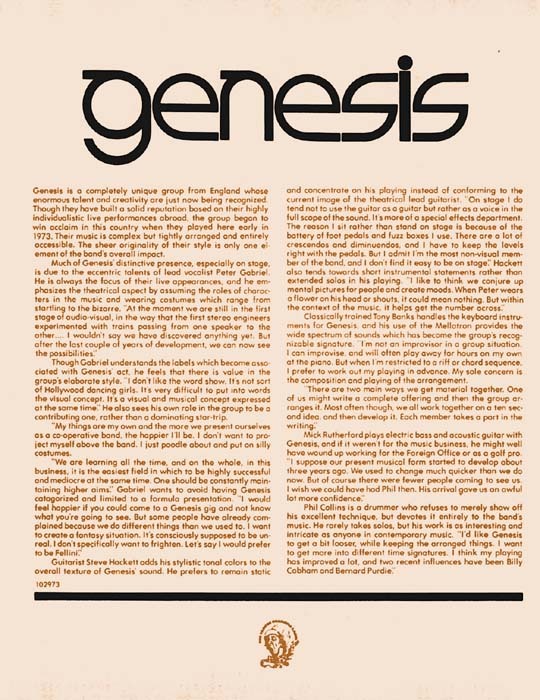 March 7, 1974 press kit titled simply 'Genesis'. 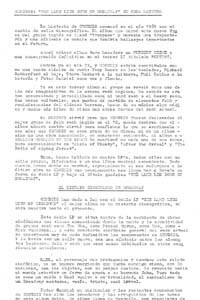 An average presentation with a lot of materials. 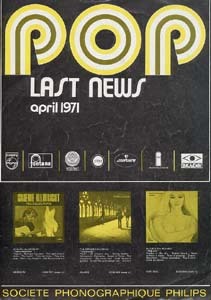 Promotes the April 11, 1974 performance and the Selling England album on the back. 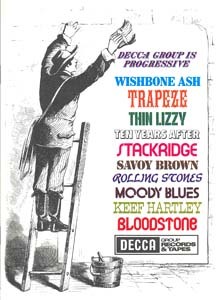 May 13, 1974 Atlantic Records catalog with Selling England by the Pound, but more interestingly includes a	story about how the May 5th show at The Academy of Music had to be postponed due to stolen guitars. 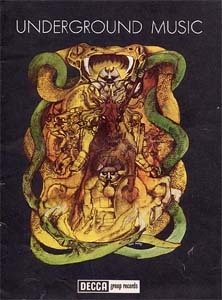 1974 Chris Briggs compilation. 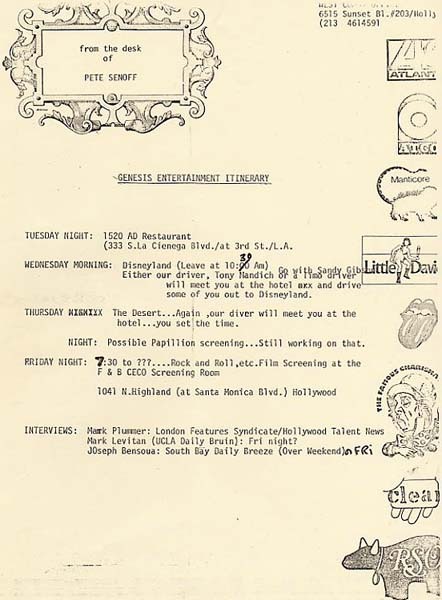 This was sold as a 'tourbook' during the Selling England tour, but is laid out much like a presskit. 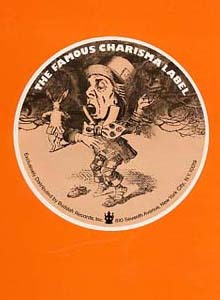 This is rare and valuable because it was an official Charisma creation. 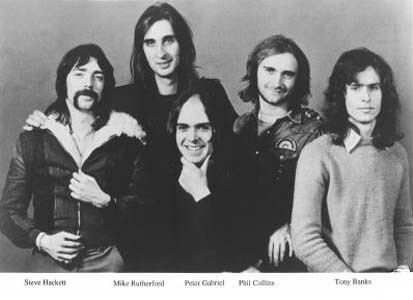 One of the promotional tool used in presskits were these press photos. 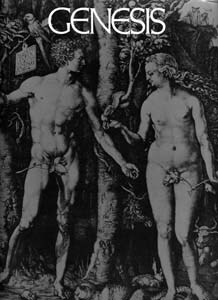 Here are several common and not-so-common Charisma labeled Black and White photographs. Many are excellent. 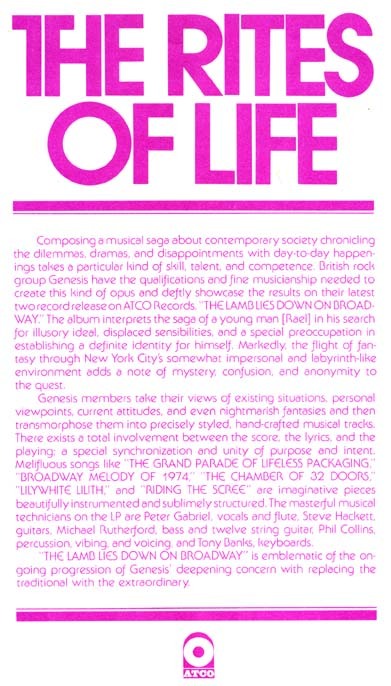 A very rare American promo sheet by ATCO about the Lamb album. Extremely difficult to find! 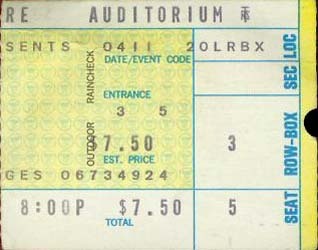 I only know of 2 copies. 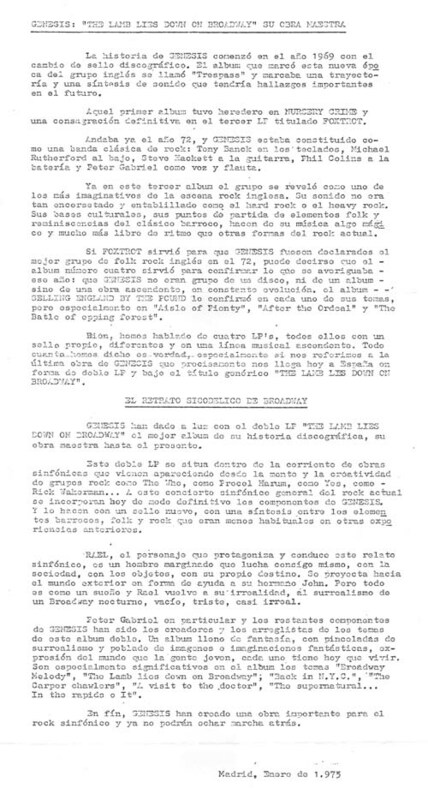 A very strange Spanish press release from Madrid January 1975. 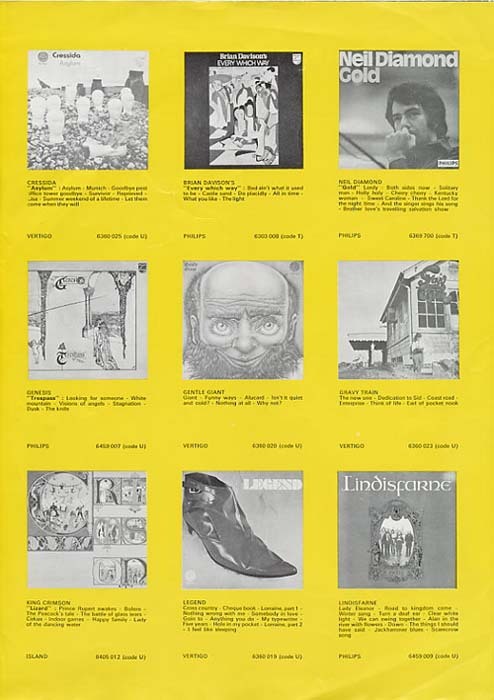 A very nice looking Charisma Catalog, Discography, and Price List 1975. 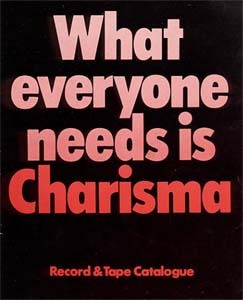 Charisma catalogue from 1977. 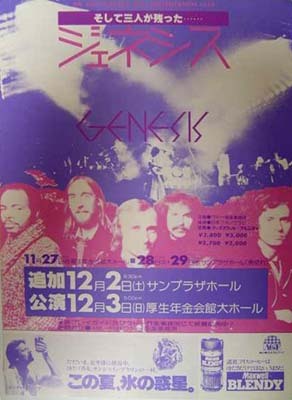 Includes a section on Genesis. 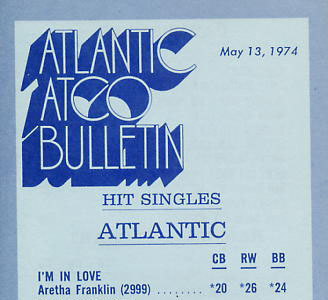 Second Out Press Kit from Atlantic October 15, 1977. 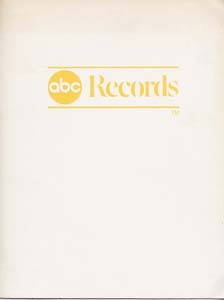 And Then There Were Three press kit from Warner Brothers, Elektra, & Atlantic Records 1978. 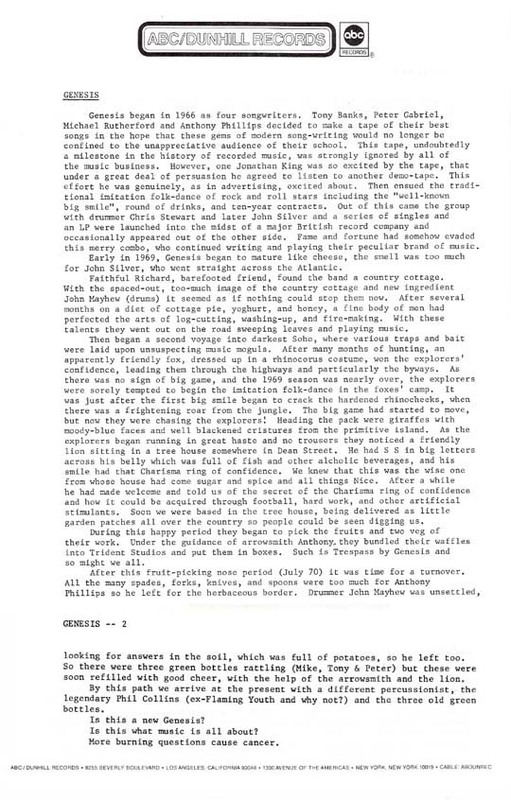 An Atlantic Records promotional presskit for the first Genesis box set.